What is a sense of place? The term has been used in different ways, but I'm talking about the sense of place that we strive for in landscape painting, a feel for the earth and vegetation, and the architecture and people that makes this place different from others. When I travel to paint, I'm searching for this sense of place, and trying to bring it home on my canvas. 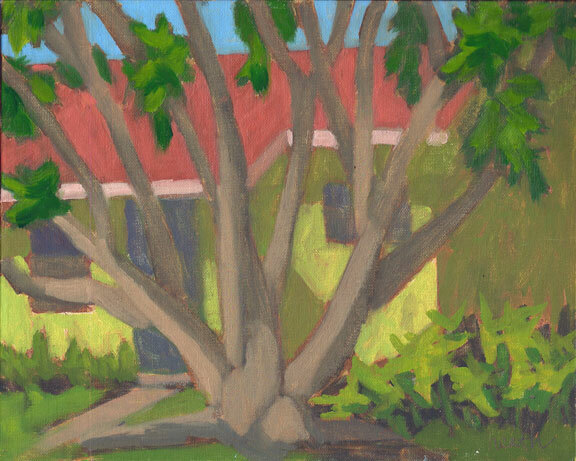 Last month I enjoyed a trip to Grand Bahama with painters Carol L Douglas and Joelle Feldman. We painted with Cali Veillieux, and stayed at her rental cottage in the beautiful and charming German Holiday Park in Freeport. So what was different about the Bahamas from our New England perspective? It was nice and warm! The next thing that hit us was the beautiful blue green ocean and the big weather that kept floating by above our heads. And of course, the vegetation was different. We needed different colors for the palm and jacaranda trees than we were used to. And there was still a lot of destruction from hurricane Matthew. The poor jacaranda tree below (my favorite painting from the trip) should have been decked out in wonderful blue blossoms, but it was just happy to be alive. 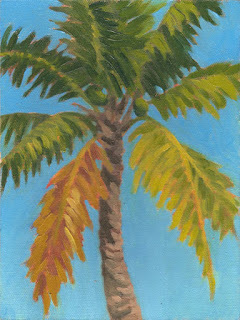 I love the palm trees, and there are so many different kinds! It took a bit of practice to even come close to painting the foliage believably. But it was fun trying. I don't think you can truly get a sense of place when you are visiting for a short while. But you can try, and in that trying learn something about the place, it's people, and their struggles and dreams. Cali and her friends do have that sense of place, and for them this is a beloved island. To us it was beautiful and a wonderful respite from our weather at home. 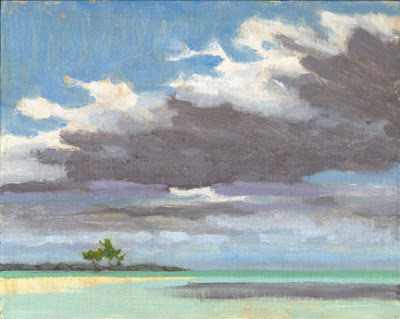 More paintings and some new Bahamas friends in another post. Thank you so much for portraying, not only on canvas, but in words, your experience on this wonderful island, as you explored a bit of her beauty. Grand Bahama is one of my favorite islands. Love the paintings! !